This year Christmas Day orrurs on a Sunday. 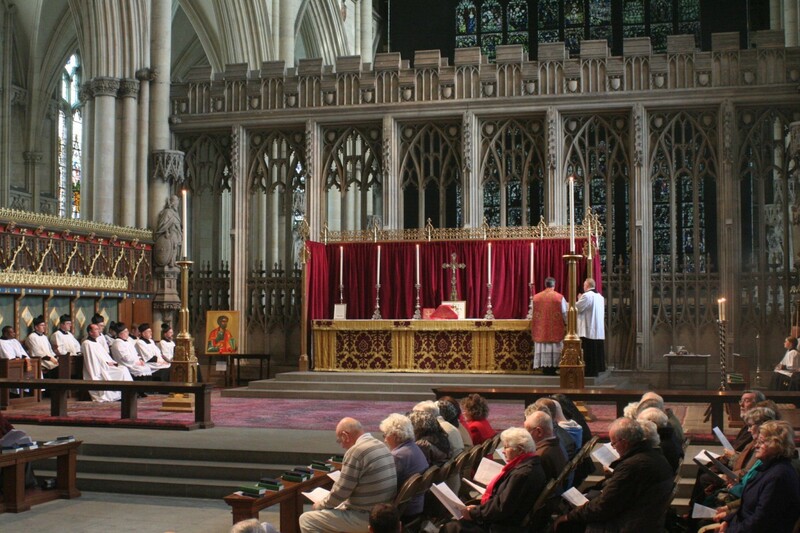 Moreover, it will be the fourth Sunday of the month and a day when there would normally be a Mass in York. 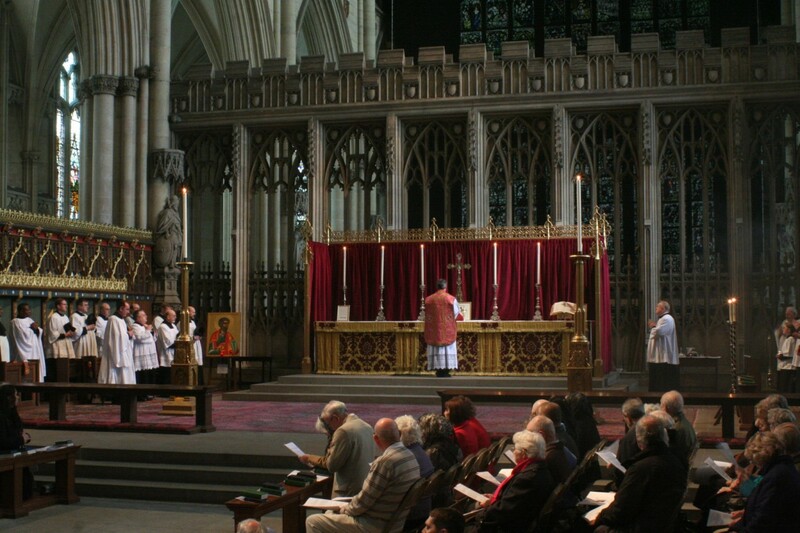 Masses will resume in York on Sunday 8th January 2012. Remembrance Day. Friday 11th November, 2011. 7pm. Vespers of the Faithful Departed. In commemoration of all those who gave their lives in the two World Wars and other conflicts. 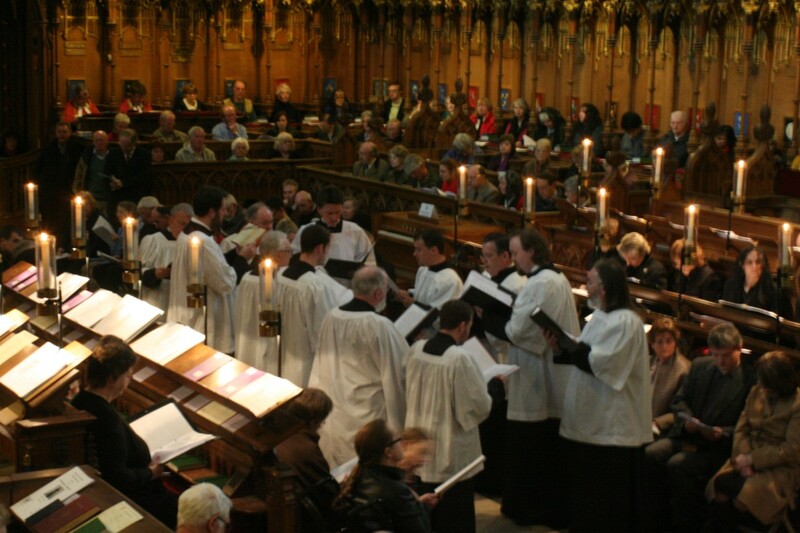 Gregorian Chant sung by The Schola of the RUDGATE SINGERS. I have just heard that David Aron has completed his walk along the Thames Way, from the source in Gloucestershire to the Thames Barrage, a distance og 184 miles. He has carried his sleeping bag and tent the whole of the way, and emerged with just one blister! The blog; That the bones you have crushed may thrill gives more information. Firstly a correction, Fr Maughan will be celebrating the Mass on the second Sunday and Fr Callaghan on the forth Sunday. This means that on Sunday 23rd October (not 22nd), the Mass will be celebrated by Fr Callaghan. Dalton Terrace is about half a mile outside the city walls and is a turning off the main road towards Tadcaster. 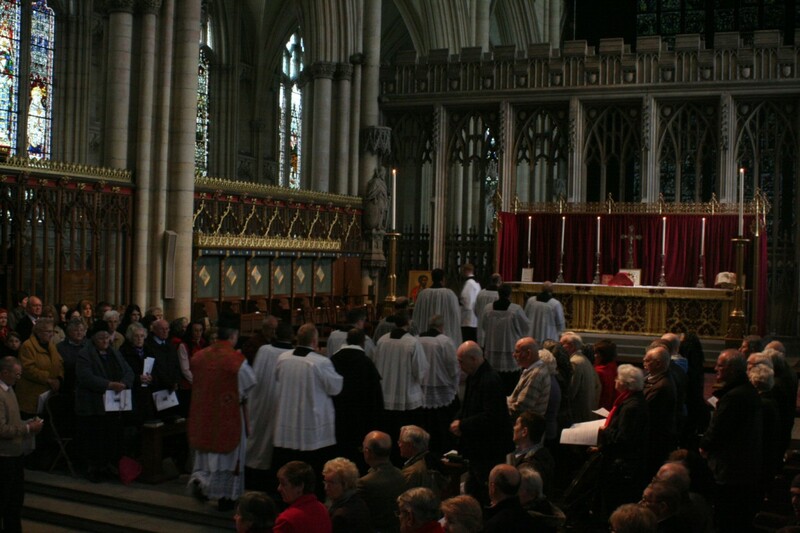 Masses in the usus antiquior are to be resumed in York. They will take place on the second and fourth Sundays of each month at 4pm beginning on Sunday 22nd October. Fr Stephen Maughan will be the celebrant on the fourth Sunday and Fr James Callaghan OSB of Ampleforth Abbey will celebrate on the second Sunday. Since both these priests will have to travel a considerable distance, it would be nice to have a large congregation. Please pass the word on to anyone that you think may be interested. There will also be talks on the spirituality of the Mass and the Rosary. Everybody welcome. Due to Mgr Heslin being away on holiday, there will be no Latin Mass at the Church of St Alphonsus in Middlesbrough on Sunday 9th October. Regular Sunday evening Masses will resume on Sunday 16th October. Mgr. Heslin took over saying the weekly 6pm Latin Mass at St Alphonsus, Middlesbrough last Sunday. However there will be no Latin Mass next Sunday, October 9th, while Mgr. Heslin is on holiday. The next Latin Mass in Middlesbrough will be on Sunday October 16th at 6.00pm and thereafter weekly. Saturday 01/10/2011 9pm. Compline by Candlelight. Sunday 02/10/2011 6.30pm. Vespers for the 16th Sunday after Pentecost. FRIDAY 07/10/2011 7pm. BVM of the Rosary. Vespers. Saturday 08/10/2011 9pm. Compline by Candlelight. Sunday 09/10/2011 6.30pm. Vespers for the 17th Sunday after Pentecost. Saturday 15/10/2011 9pm. Compline by Candlelight. Sunday 16/10/2011 6.30pm. Vespers for the 18th Sunday after Pentecost. Saturday 22/10/2011 9pm. Compline by Candlelight. Sunday 23/10/2011 6.30pm. Vespers for the 19th Sunday after Pentecost. Sunday 30/10/2011 6.30pm. Vespers for the Feast of OLJC the King, followed by Compline. All services take place at the Church of St. Mary, Bishophill Junior York YO1 6EN. The times of Sunday Vespers may possibly change depending on whether occasional Sunday Masses are resumed next month. 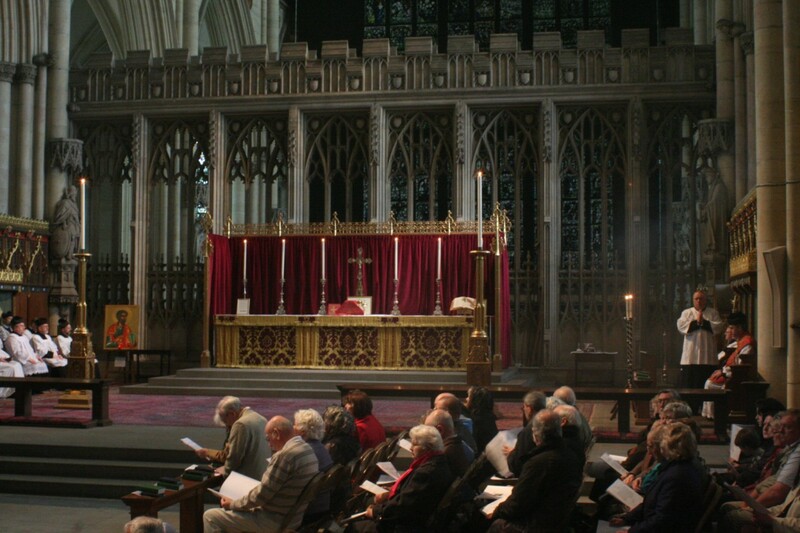 There will be no evening Mass at the Church of the English Martyrs in York this Sunday, 25th September. Please pass this information on to anyone that you think may be thinking of attending. 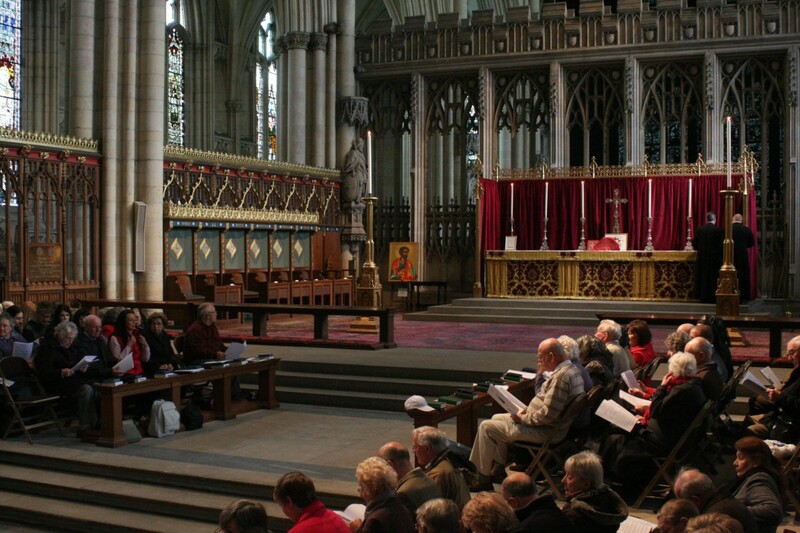 Information about when Masses will resume in York will be posted as soon as it becomes available. Today, 14th September, is the feast of the Exaltation of the Holy Cross, a feasst day that appeals greatly to me, because of the importance of the Holy Cross to the whole concept of Christianity. 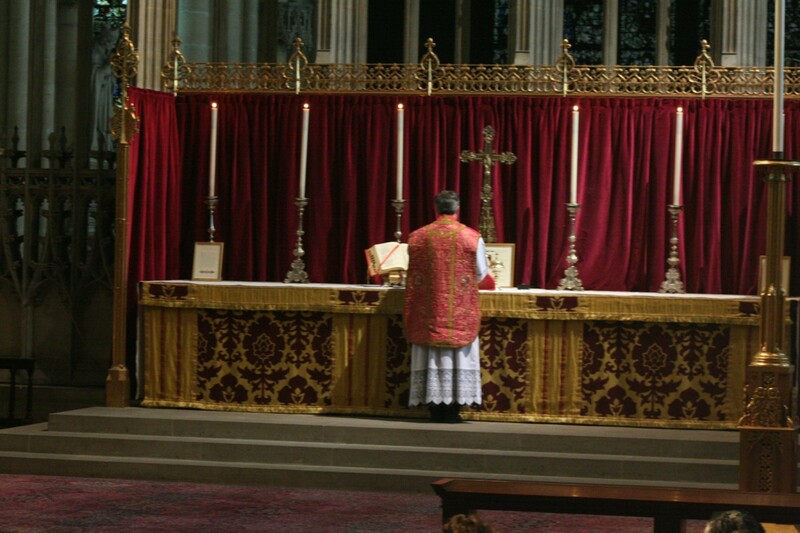 It also appeals to me, because it is the anniversary of the coming into force, four years ago, of the Holy Father's motu proprio, Summorum Pontificum. Today is also of special significance to the traditional movement within the Church, because an important meeting is taking place between Bishop Fellay of the SSPX and Cardinal Lavada of the Congregation for the Doctrine of the Faith. There is speculation amongst some journalists and Vatican watchers that this meeting could be the start of the resolution of the differences between the SSPX and the Magisterium of the Church. Let us hope that this is the case. "Can it be completely mistaken to work to break down obstinacy and narrowness, and to make space for what is positive and retrievable for the whole? I myself saw, in the years after 1988, how the return of communities which had been separated from Rome changed their interior attitudes; I saw how returning to the bigger and broader Church enabled them to move beyond one-sided positions and broke down rigidity so that positive energies could emerge for the whole. Can we be totally indifferent about a community which has 491 priests, 215 seminarians, 6 seminaries, 88 schools, 2 university-level institutes, 117 religious brothers, 164 religious sisters and thousands of lay faithful? Should we casually let them drift farther from the Church? I think for example of the 491 priests. We cannot know how mixed their motives may be. All the same, I do not think that they would have chosen the priesthood if, alongside various distorted and unhealthy elements, they did not have a love for Christ and a desire to proclaim him and, with him, the living God. Can we simply exclude them, as representatives of a radical fringe, from our pursuit of reconciliation and unity? What would then become of them? Certainly, for some time now, and once again on this specific occasion, we have heard from some representatives of that community many unpleasant things – arrogance and presumptuousness, an obsession with one-sided positions, etc. Yet to tell the truth, I must add that I have also received a number of touching testimonials of gratitude which clearly showed an openness of heart. But should not the great Church also allow herself to be generous in the knowledge of her great breadth, in the knowledge of the promise made to her? Should not we, as good educators, also be capable of overlooking various faults and making every effort to open up broader vistas? And should we not admit that some unpleasant things have also emerged in Church circles? At times one gets the impression that our society needs to have at least one group to which no tolerance may be shown; which one can easily attack and hate. And should someone dare to approach them – in this case the Pope – he too loses any right to tolerance; he too can be treated hatefully, without misgiving or restraint." Since his appointment to the Church of St Alphonsus in Middlesbrough about three years ago, Fr Charlton has celebrated a Mass in the usus antiquior at his church each Sunday evening at 6pm. 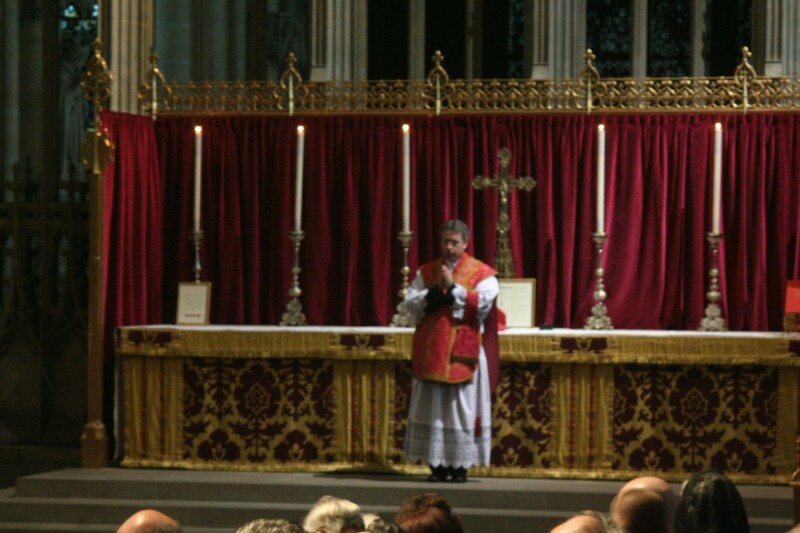 Prior to his moving to Middlesbrough, Fr Charlton was the regular celebrant of the 6.30 Sunday evening Mass in York. News has filtered down that Fr Charlton will be leaving Middlesbrough later this month to be part of a newly formed community of Benedictine monks in France. We wish Fr Charlton and the new community every success. 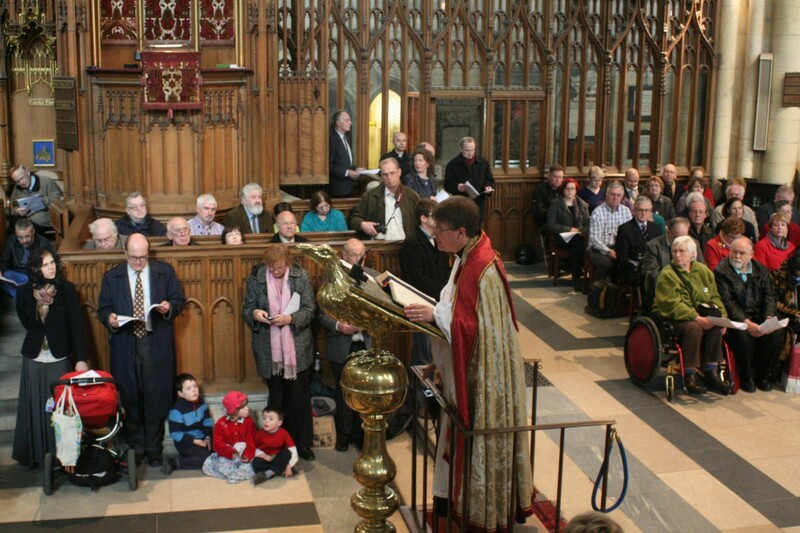 Some had feared that this move would bring about the end of Latin Masses in Middlesbrough. 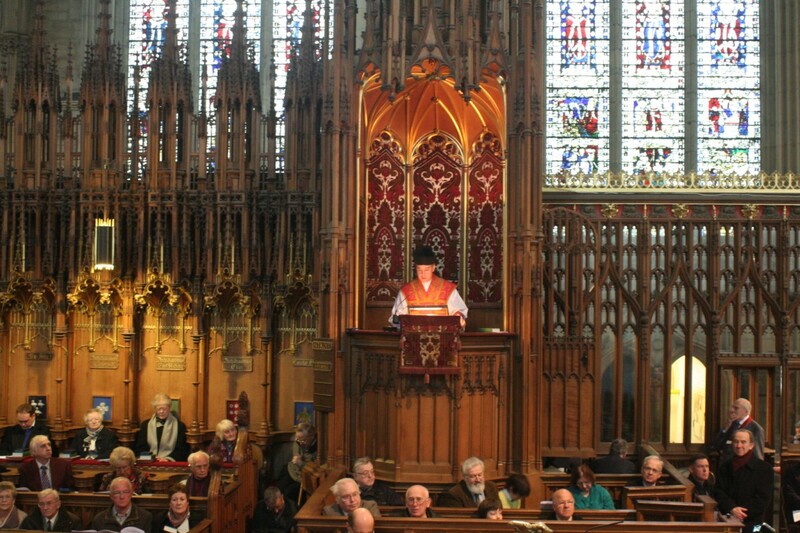 I am pleased to be able to confirm that the Middlesbrough Sunday evening Masses will continue. The celebrant will be Mgr John Heslin, a retired priest of the Birmingham Archdiocese living in Saltburn. He used to celebrate First Friday Masses at the Church of St Clare in Middlesbrough. I hope that Mgr Heslin's Masses will be well supported. Will be sung by the Rudgate Singers at St Mary's, Bishophill Junior at 6.30pm this coming Sunday, 11th September. Please do join us. I have recently returned from the walking pilgrimage from Ely to Walsingham, a distance of 55 miles, and it was a great experience. I should add that I only walked the final mile. My role was driving a support vehicle, which carried some of the baggage and was available to pick up anyone who could walk no further. Over 30 young and not so young people walked the whole distance over three days. They prayed the rosary and sang hymns much of the time, and there were opportunities for confessions to be heard by Fr Rowe along the way. It was a great occasion and even the rather wet, and sometimes stormy, weather did not dampen the spirits of the pilgrims. There was a sung Mass each day. On the Friday it was at 6am in the church of St Etheldreda before setting off from Ely, and on the Saturday, it was in in the chapel of Oxborough Hall. The Sunday Mass was at the shrine in Walsingham, and the walking pilgrims were joined by others who had travelled there by coach or car. For me the high point was walking the Holy Mile into the village of Little Walsingham. Many, but not me, did this bearfoot. We carried a processional cross, and sang the Rosary and a Litany as we walked. The musical setting of the Ave Maria was new to me, and is apparently the one used on the Paris to Chartres pilgrimage. I found it very attractive and suitable for the occasion. People certainly joined in well. The procession took us to the grounds of the former abbey which is the site of the original shrine. Plans are now being made for next year, when we expect to have a bigger and better pilgrimage. Saturday 10/09. 12:00pm Brinkburn Priory, Northumberland. 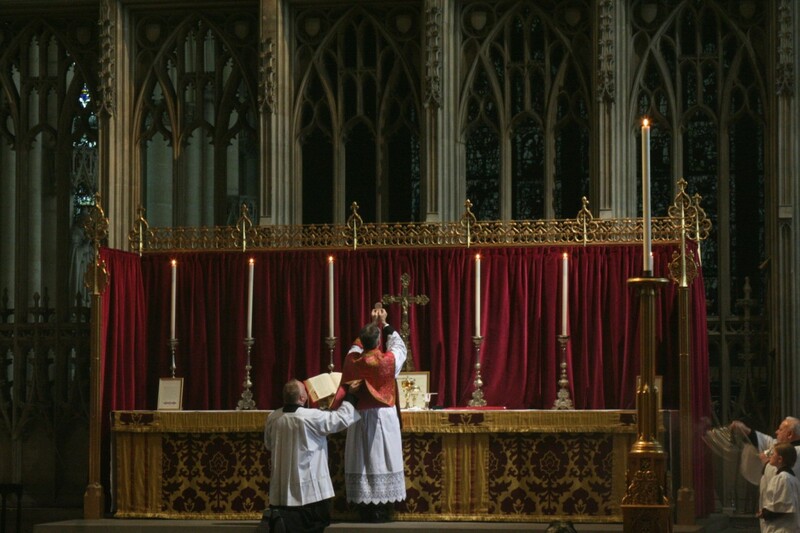 Note: NO Chant SERVICES the weekend of 17/18th September in York, as I shall be down in Oxford singing for the Ordination to the Sacred Priesthood of fr. Lawrence Lew OP. Much has been written on various blogs about the coverage of World Youth Day by the BBC. All seem to agree that it was abyssmal. I estimate that 95% of the coverage was about the relatively small demonstration by illinformed people protersing at the visit. Of the remaining 5%, much of it was devoted to a freak gust of wind that blew off Pope Benedict's skull cap. Whilst at it, please encourage others to do the same. Fr Ray Blake has a post on his blog about the external marks by which Catholics were, at one time, easily recognised. The implication is that nowadays most of these practices are rarely seen. Making the sign of the cross when passing a church. What prompted this discussion was the welcome proposal of the bishops of England and Wales to re-introduce Friday abstinence. The list suggests plenty more customs and practices that could be revived. Please note that due to the absence of Father Maughan on holiday, there will be no evening Masses in York on Sundays 7th and 14th August. There will be Sunday Masses on 21st and 28th August, but after that the routine will change. Fr Maughan is moving to the northern part of the diocese, where he will be parish priest at Loftus, Brotton and Staithes. 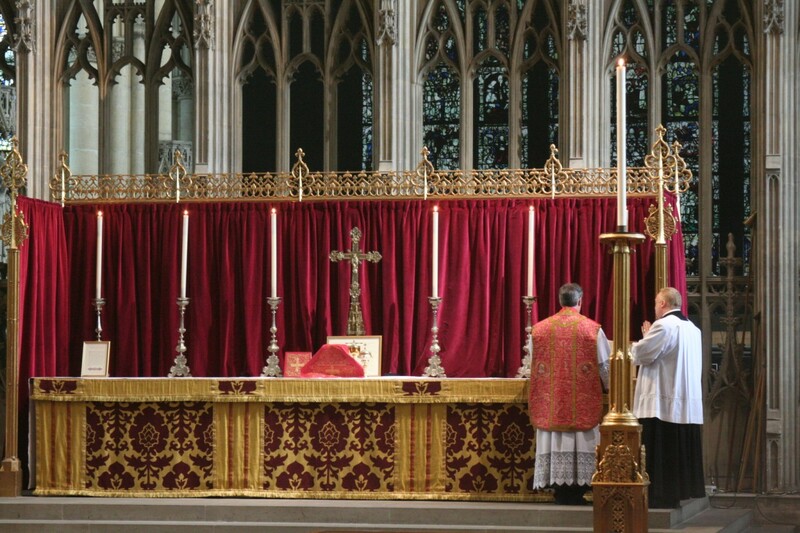 Bishop Drainey is keen that the usus antiquior Masses in York continue, and he has asked Fr Maughan to travel to York on one Sunday each month to celebrate this Mass. As things are planned at present this will be the last Sunday of the month. I understand that Bishop Drainey is seeking further provision, but I have no information about this yet. Any news will be posted as it becomes available. Although covering a large geographical ares, the Diocese of Middlesbrough is relatively small in terms of Catholic population and the number of parishes. It is also a diocese where the shortage of priests is particularly accute. As a consequence, many of the priests that we do have, are doing more than one job. In these circumstances, it is difficult for the bishop to find priests who is able and willing to celebrate Mass in the usus antiquior. Bishop Drainey has asked us to pray for priestly vocations. Please do so, because an influx of new priests is desperately needed. Following on from Et Expecto's post about children singing Chant, it's not too late to register for this. There is a very good video of primary age school children singing plainchant circulating around the internet. It can be found on Fr Finigan's, The Hermenutic of Continuity amongst other places. I recomment it. 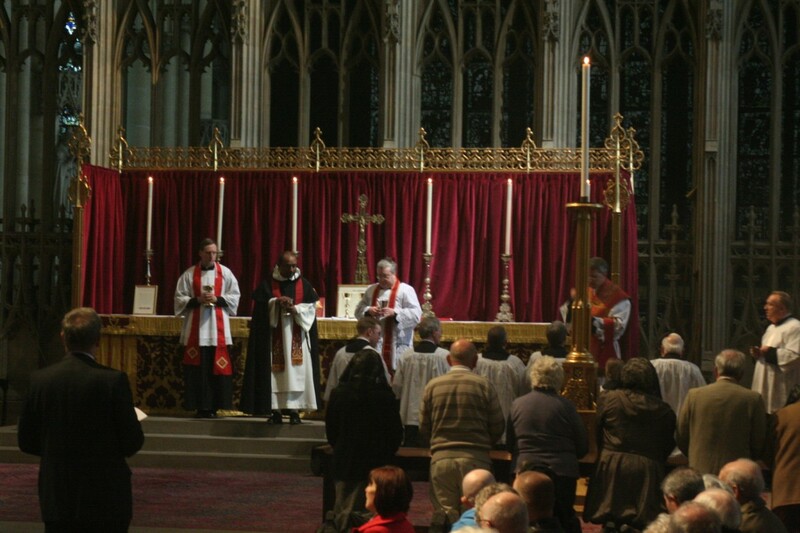 The Mass at the Church of the English Martyrs in York today (Feast of St Peter and St Paul is now at 7.30pm. Sorry for any confusion. Wednesday 29th June is the feast of St Peter and St Paul and there will be Mass at the Church of the English Martyrs in York at 6pm. It is also the sixtieth anniversary of the priestly ordination of Pope Benedict XVI. We should use this occasion to say a prayer or two for the intentions of the Holy Father, who has an exceptionally difficult job steering the Church in troubled times. News is spreading that Father Stephen Maughan will be leaving York shortly to become the parish priest of the combined parishes of Loftus, Brotton and Staithes. The date of his move is not yet known. 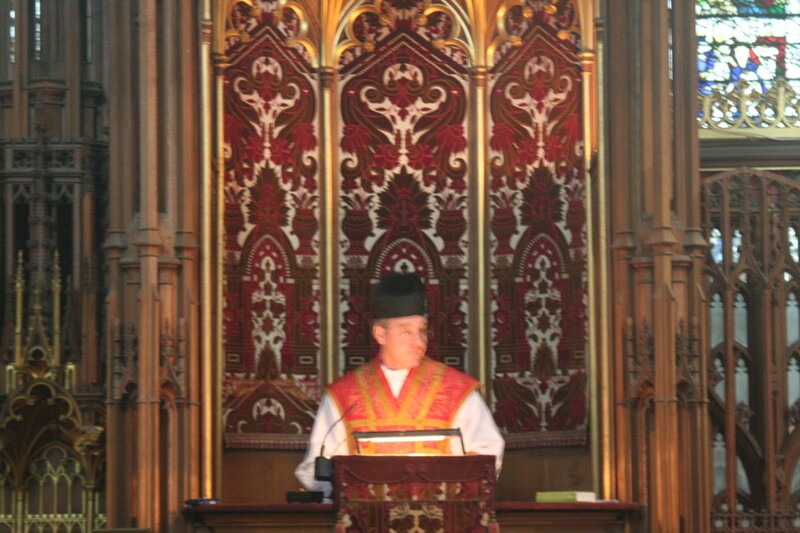 I am sure that everyone that has attended the Sunday evening Masses that Fr Maughan has said or sung for us at the Church of the English Matryrs in York will wish him well in his new appointment. Nothing has been said officially, but it is rumoured that Bishop Drainey wants the usus antiquior Masses in York to continue. 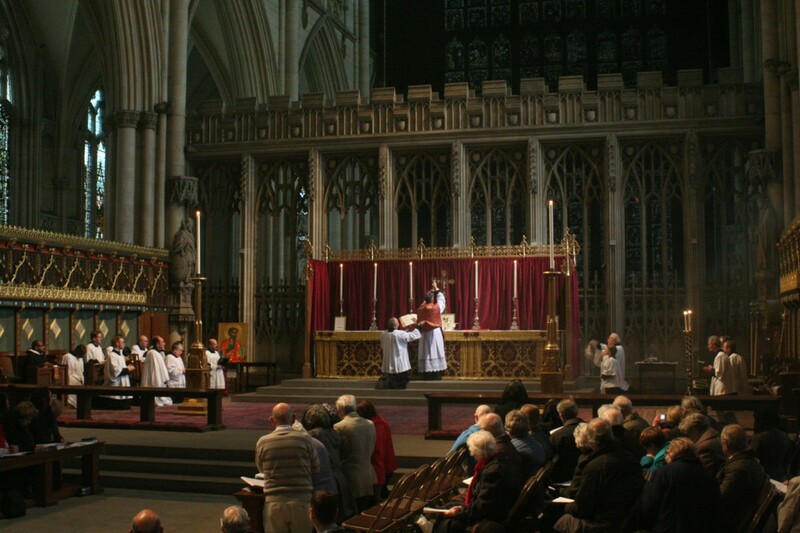 It is probable that Fr Maughan will visit York on at least one Sunday each mouth and that some other provision will be made on the other Sundays. We must be grateful to Bishop Drainey for his concern for the followers of the traditional Mass. There will be a 6.00pm Mass at English Martyrs' Church, York on the feast of Corpus Christi, Thursday 23rd June. 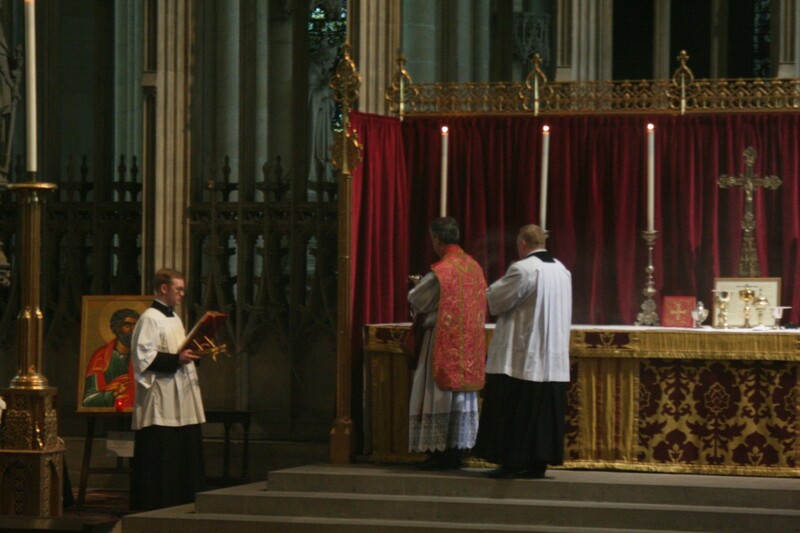 It will be followed by a short procession, with the Blessed Sacrament. We are looking for a good sized congregation. Therse two Masse really will take place, unlike on the feast of the Ascension, when Fr Maughan was in Lourdes. There will be a short procession after Mass of Corpus Christi. 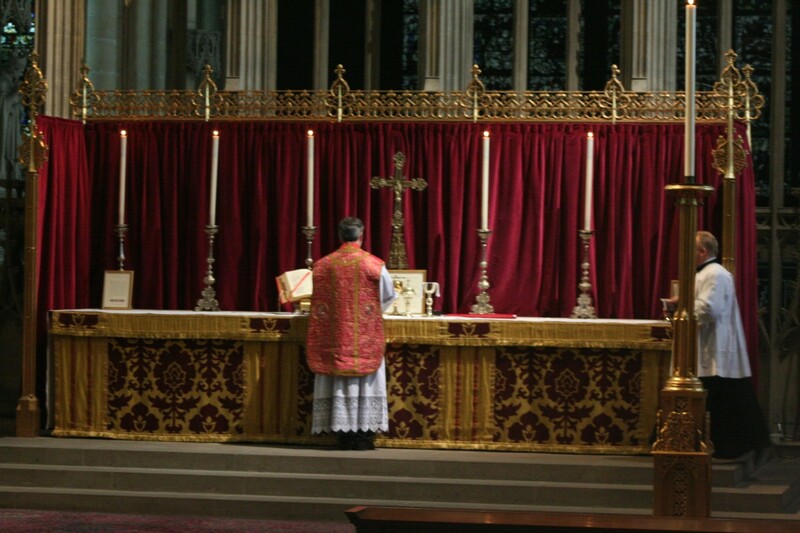 Fr Simon Henry at Offerimus tibi Domine has a very good post today about the implementation of Summorum Pontificum and Universae Ecclesiae. I would recommend anyone to read it. These documents cover many areas, and one could spend a long time studying them. However, I would like to single out Article 5.1 of Summorum Pontificum. This is the bit that states that any stable group of the faithful is entitled to ask their "pastor" (parish priest of equivalent)for provision of the Mass and the other sacraments in the usus antiquior. Universae Ecclesiae explains that the group can be small and members need not necessarily come from the same parish, or indeed diocese. So any group of people, five would be sufficient, who are stable (ie not here today and gone tomorrow) is perfectly entitled to ask their priest for provision of Mass in the older form. He should do his best to to satisfy the request in a reasonable fashion. This may be with a differenr priest as celebrant, or in a neighbouring parish. The point is that all reasonable possibilities should be explored. If, after exploring the possibilities, the priest cannot find a way of satisfying the request, or it is felt that the priest has not taken the request sufficiently seriously, the applicants have the right to refer the matter to the bishop of the diocese. It then becomes his duty to attempt to resolve the matter. If this fails, the matter can be referred to Rome. So that there can be no dispute, it would be wise for the original request and all subsequent correspondence, to be in writing, and contain the names of all the applicants. 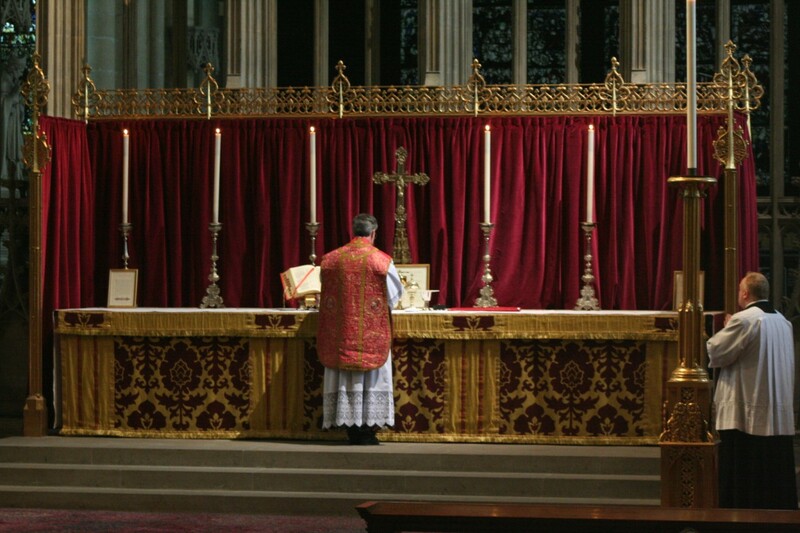 Summorum Pontificum is remarkable in the degree to which it delegates power to the laity. 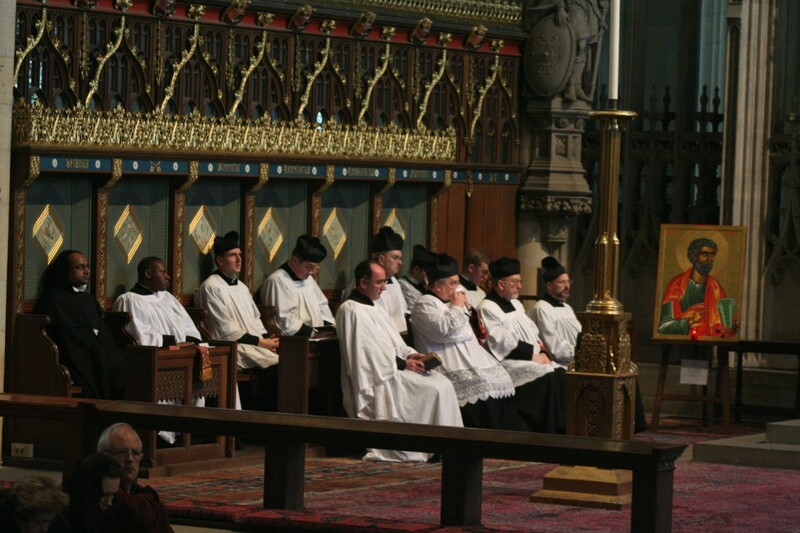 In matters concerning the older rites, the laity are empowered to set the ball rolling, and the clergy, even possibly the episcopy, are required to respond. Where reasonably practical, they must at least attempt to deliver the goods. People often say that there is no point in asking their parish priest, because he is "so against it". In fact it is important that the question is asked, regardless of the expected answer, because the very asking is an important part of the procedure laid down by Summorum Pontificum. All bishops have recently had to send a report to Rome dealing with the reception of summorum pontificum in their diocese. One of the points that they will, no doubt, have remarked on is the number of requests that were received during the three year period. This is why I say that it is up to you. If you don't ask you don't get. It you take the trouble to make a request, something should happen. You will notice that I have used the words "reasonably practical" and "reasonably possible" several times. We have to accept that many priests have never learned any Latin in their life, and may find the language very difficult. There may be other priests who, although they may be able to cope with the Latin, are so set in their ways that they cannot bring themselves to learn something new. On the other hand, as Father Henry says, there are priests about that are very willing and able to say Mass in the usus antiquior. There are more than 100 who have attended the Priests' Training Conferences put on by the Latin Mass Society. There are many others who have taught themselves. In most cases, these priests would be delighted to be asked. 1. 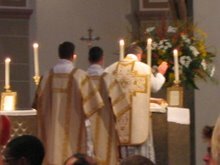 There is no minimum size for a stable group of the faithful asking for a traditional Mass, and its members do not have to come a single parish or, indeed, diocese. 2. 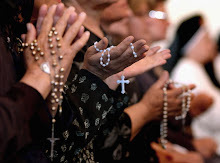 No priest visiting a church, oratory or place of pilgrimage who has the correct credentials can be refused the right to celebrate Mass in the older form. 3. Priests do not have to be fluent or expert in Latin to celebrate the older rite. They are only required to be able to pronounce the words correctly, and understand what they are saying. Clause 28 of the document will probably produce the most debate, and turn out to be the most important one. Although it is dangerous to paraphrase a legal document, I shall try to do so. 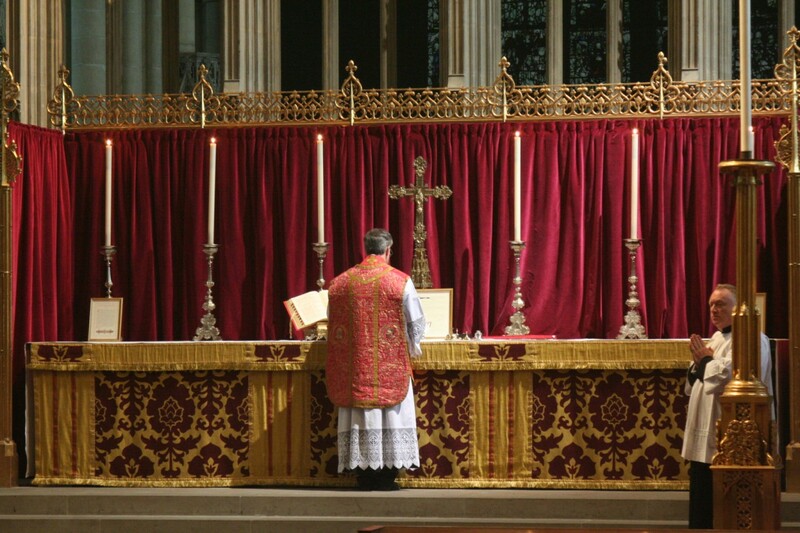 Broadly, it states that summorum pontificum derogates all provisions of Church law promulgated after 1962 which are connected with sacred Rites and which are incompatible with the 1962 liturgy. If my interpretation is correct, this means that liturgical innovations introduced after 1962 cannot be applied to the usus antiquior. It would seem to imply that practices such as Communion on the hand, the use of extraordinary ministers of the Eucharist and female altar servers are definitely ruled out for the extraordinary form. It would be useful if a canon lawyer would give a considered opinion on these matters. Ordinaries are asked to offer their clergy the possibility of acquiring adequate preparation for celebrations in the forma extraordinaria. This applies to seminaries, where future priests should be given proper formation, including the study of Latin, and where pastoral needs suggest it, the opportunity to learn the the forma extraordinaria of the Roman Rite. 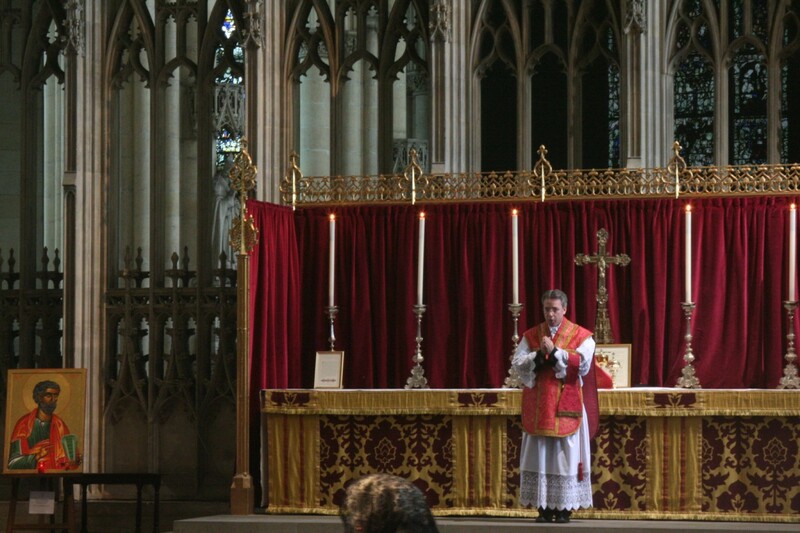 To book into the walking pilgrimage, go to the website of the Latin Mass Society. All at the church of St. Mary, Bishophill Junior, York (York's oldest church), commencing at 9pm. Many of you will, I'm, sure, have heard of us. Some no doubt, will have heard us sing at various services that have taken place in the North of England over the last few years. What you may not know, is that the idea to form the choir originated in prison! I used to work for the Prison Service, and a chance conversation with one of the Catholic Chaplains where I worked (Fr. Richard Aladics) led to the first Rudgate Service which took place in the beautiful catholic church in Scarthingwell, back in June 1996, where amongst other pieces, we sang the Missa Papae Marcelli by Palestrina. What we believed would be a one-off occasion (or annual at best) clearly didn't turn out to be the case, and we now approach our 15th Anniversary! 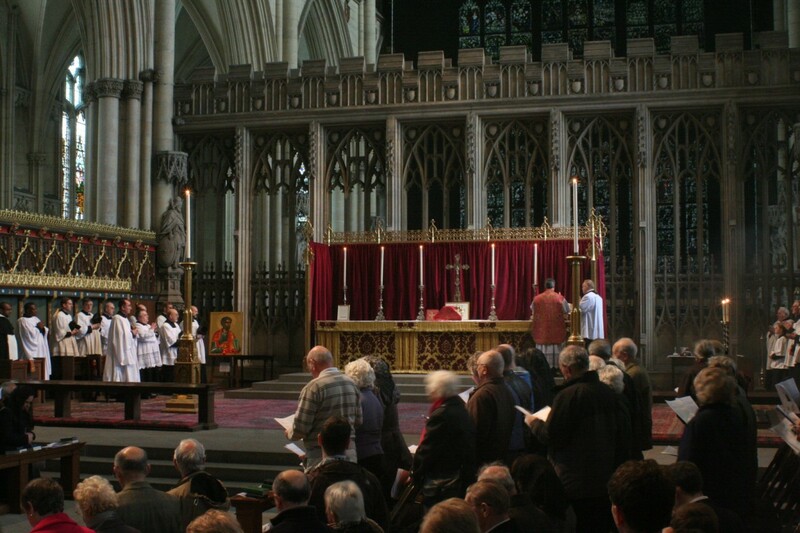 as well as the full Chant Proper of the Mass of Whit Saturday from the Graduale Romanum. Fr. Stephen Maughan, who celebrated the historic Mass in York Minster earlier this year, has kindly agreed to be the Celebrant, for what we hope will be another special occasion. Please do put the date in your diaries. Young Catholic Adults National Weekend. This is a little late, so you may have already read it elsewhere. My excuse is that I succumbed to an extremely nasty cold just after Easter & haven't felt like doing much else since, apart from the Rudgate Singers' Stow Minster Service. During the weekend of the 9-11 September 2011 Young Catholic Adults will be running a weekend at Douai Abbey, it will be led by Juventutem Ecclesiastical Assistant Fr de Malleray . The weekend will be full-board. £35 PER PERSON PER NIGHT (full board). Self catering £25 per person per night (reductions for students:- or whatever you can afford) . £5 PER PERSON PER NIGHT (or whatever you can afford - please bring your own tent and food ). If you would like lunch on Sunday 11th then it will be an extra £7 each. To reserve your place FOR THE WEEKEND (no deposit needed if you are coming for the day on Saturday), please contact the Guestmaster direct and send a 20 pound deposit (NON RETURNABLE) to Brother Christopher Greener OSB, Douai Abbey, Upper Woolhampton, Reading, Berks. RG7 5TQ (please make any cheques payable to Douai Abbey). Please mention how long you wish to stay and any special diet. For general enquiries about the weekend:- or any queries about the accommodation/location/lifts required please ring Damian Barker on 07908105787 or 01452 539503. I read this morning that Bishop Edward Slattery of Tulsa in the USA, together with Sr Theresa Gottschalk, have enabled the Priestly Society of St Peter to take over the Convent of Our Lady of Sorrows at a place called Broken Arrow. I presume that the order of nuns to which Sr Theresa belongs has shrunk to the extent that they are no longer able to maintain a presence in this particular convent. If this is the case, it is a story replicated many times over in numerous places in the western world, including in England. What is to be commended in this case is that both Bishop Slattery and the superior of the order of nuns have taken the trouble to consider how this redundant convent can continue to serve the Church. They have come up with the simple solution of offering the buildings to the FSSP, who will now be able to locate a resident priest there. A few weeks ago, we were able to read a similar story. Bishop Andre Joseph Leonard of Brussels decided to make the conventual Church of St Anne available to the Institute of Christ the King, Sovereign Priest, giving them a fine church in which to establish a traditional Mass centre in one of the capital cities of Europe. More recently, we have been able to read that Bishop Mark Davies of Shrewsbury is willing to hand over the Church of St Peter and St Paul in New Brighton to the Institute of Christ the King with a view to their setting up a centre for eucharistic adoration. This imposing church with adjacent presbytery occupies a very prominent position on high ground in the Wirral, and was closed in 2008, on the grounds that it was too expensive to maintain. The latest information is that this project is likely to proceed. 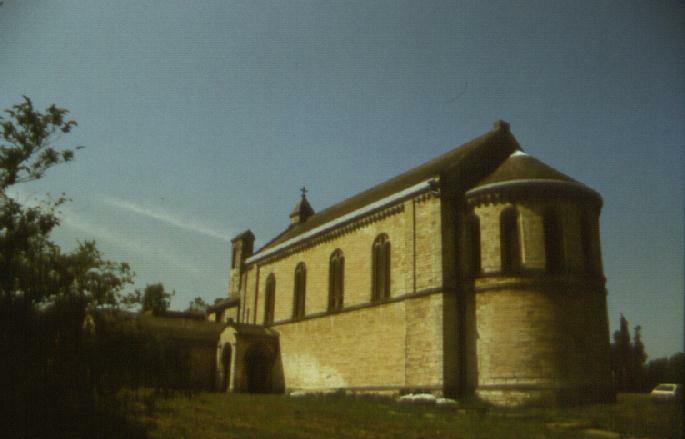 Here are three examples of redundant ecclesiastical property being put to good use. Although I would not wish to quote specific cases, I can think of many examples where convents and churches have been closed with no consideration given to finding ways in which they may continue to serve the Church. Let us hope that the example given by these three bishops will be noticed and taken up by church leaders more generally. On 29th June, the feast of St Peter and St Paul, our Holy Father, Pope Benedict XVI will celebrate the sixtyieth anniversary of his priestly ordination. This would be a great occasion in the life of any priest, but in the case of the Pope it is also a great occasion for the whole Church. Pope Benedict has had an exceptionally distinguished career having held the positions of professor of theology at various universities, Archbishop of Munich & Freising, Prefect of the Congregation for the Doctrine of the Faith, Dean of the College of Cardinals and Supreme Pontiff. He is also the author of many learned books. Thurs 2nd June Ascension of Our Lord. You have seen the pictures, now for the words. We did not know how many people would come to York for the pilgrimage in honour of St Margaret Clitherow. We thaught that there would be more than 200, and perhaps up to 500. 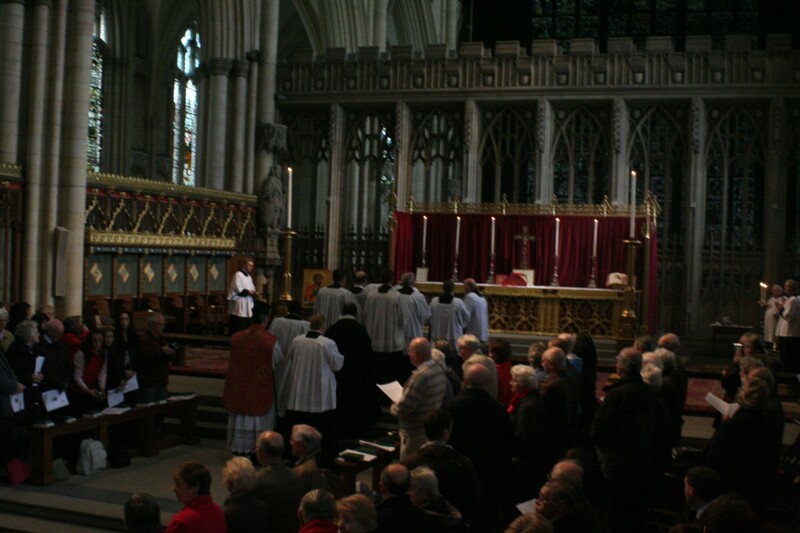 Although we were unable to count the numbers at Mass in York Minster, we now think that there were around 750. 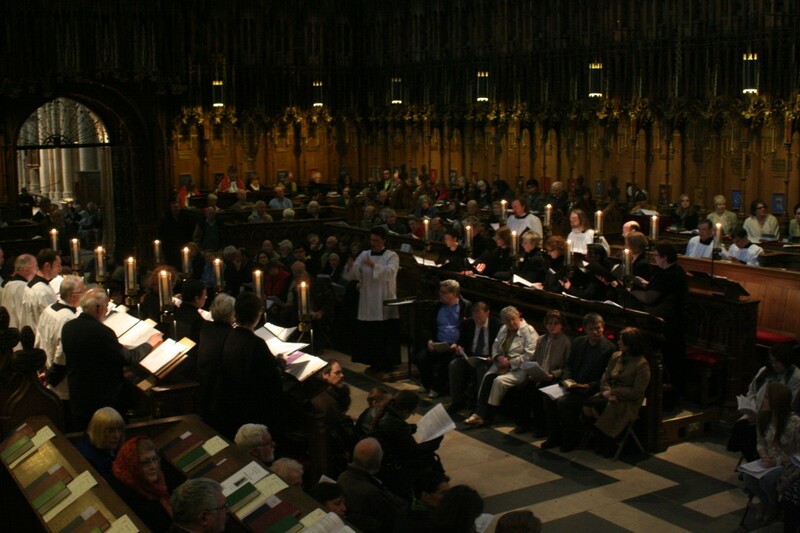 As the choir section of the Minster filled up, vergers were busy bringing in more chairs, increasing the capacity from 500 to about 600. 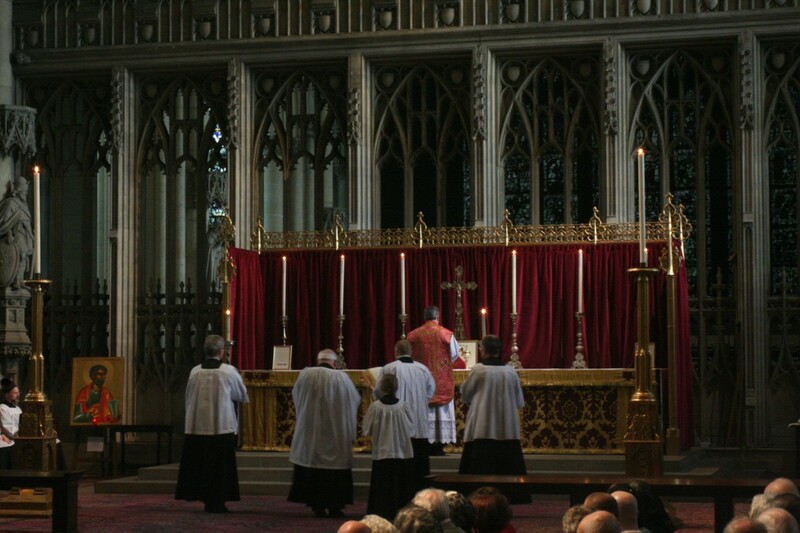 Even this was not enough, and a further 150 had to sit in the nave , where they had no view of the Mass. 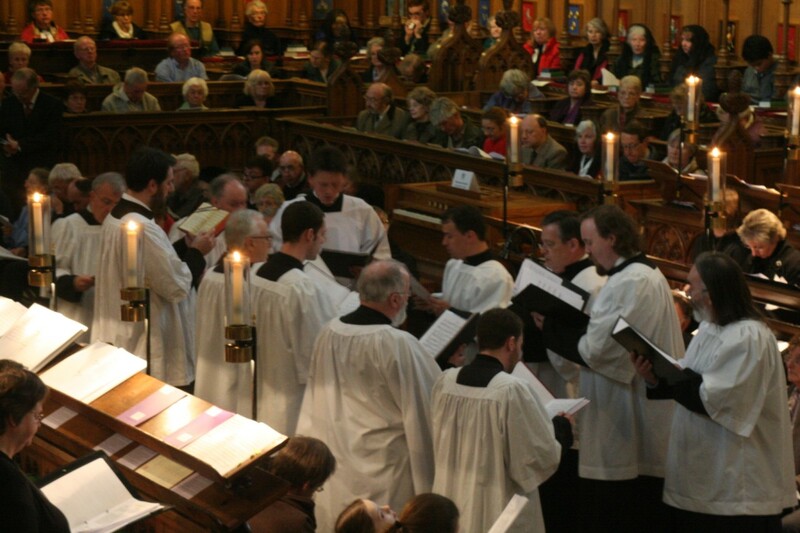 The Rudgate Singers sang Byrd's Mass for Five Voices and a schola sang the propers from the Liber Usualis. All reports speak very favourably of the singing. We were very lucky to have an excellent singer in Father Stephen Maughan as the celebrant. 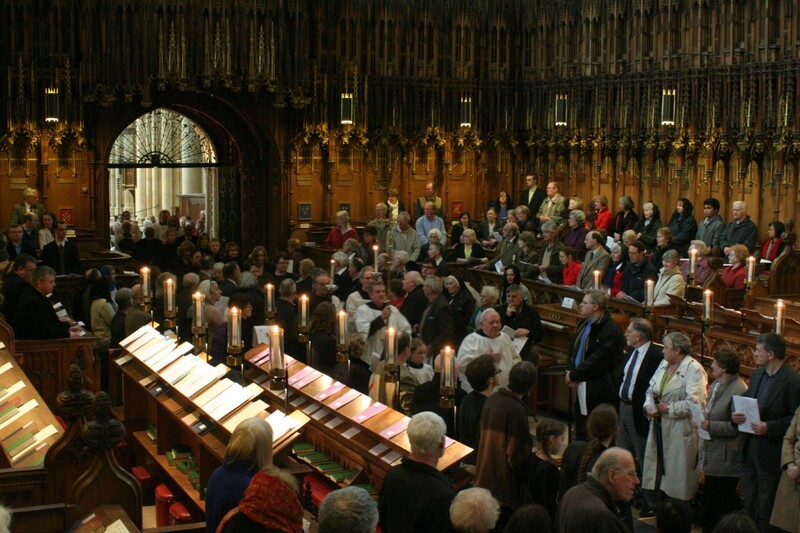 I was especially pleased that the majority of the congregation stayed to take part in the procession through the busy parts of York to the Church of the English Martyrs. The distance of a mile and a half must have been taxing for some. 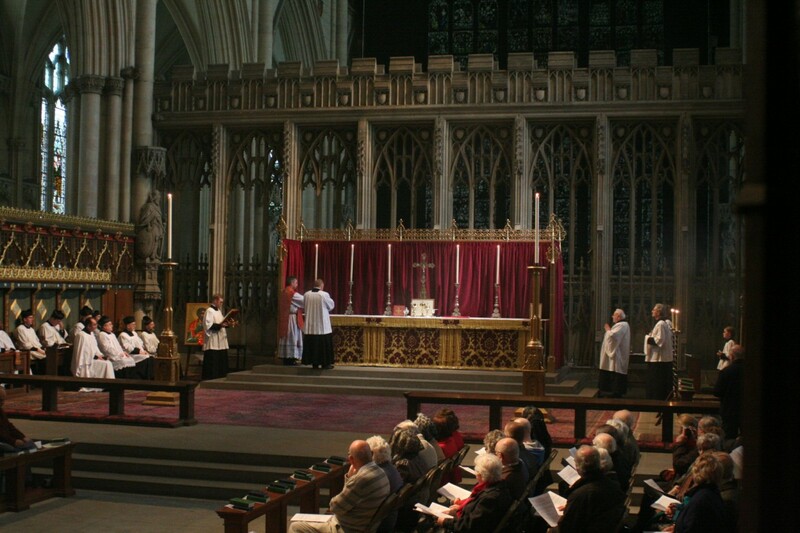 There was a capacity congregation of about 500 for Benediction offered by Father Michael Brown and veneration of the hand of Margaret Clitherow. Again, the Rudgate Singers provided the singing. 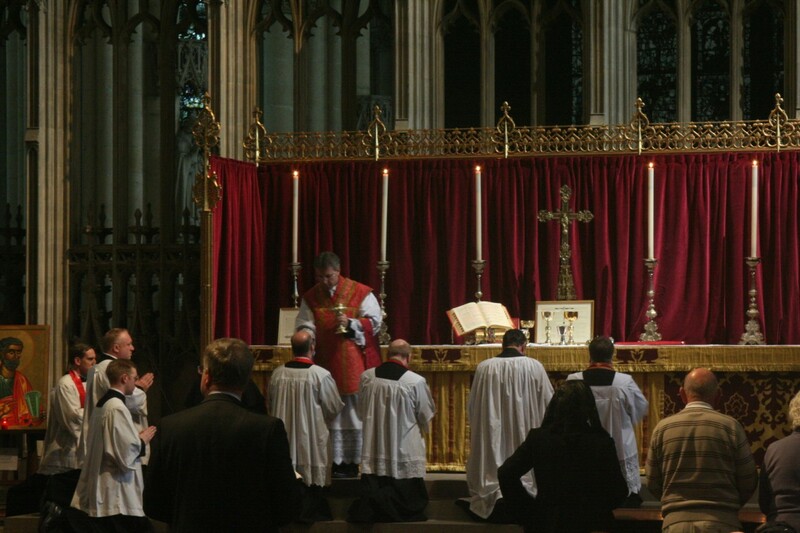 The first sung Latin Mass at the High Altar of York Minster since the reign of Mary Tudor. 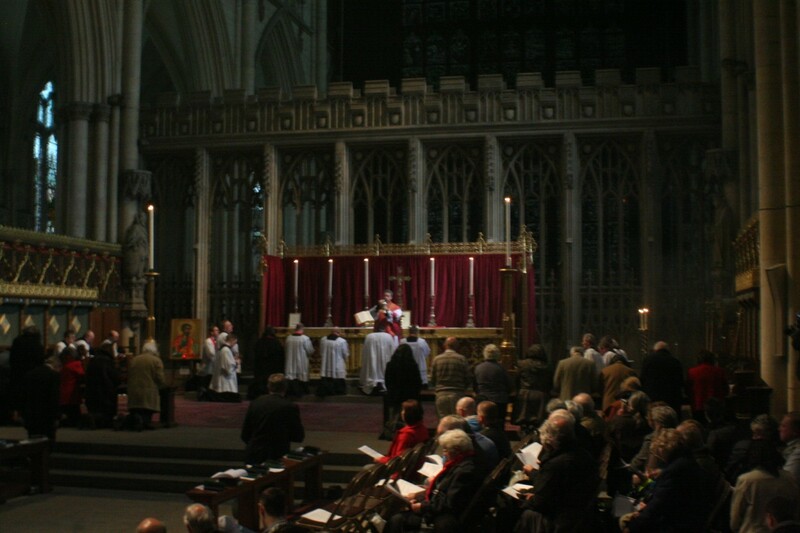 On Friday 25th March, there will be an evening Mass at 6.30pm at the church of the English Martyrs in York. This is, of course, the day before the big pilgrimage in York. Arrangements for the pilgrimage in honour of St Margaret Clitherow are now well advanced. There will be coaches from London and Leeds, and a party will be travelling by train from London. There is also news of people coming from Oxford, Shrewsbury and Lancashire. 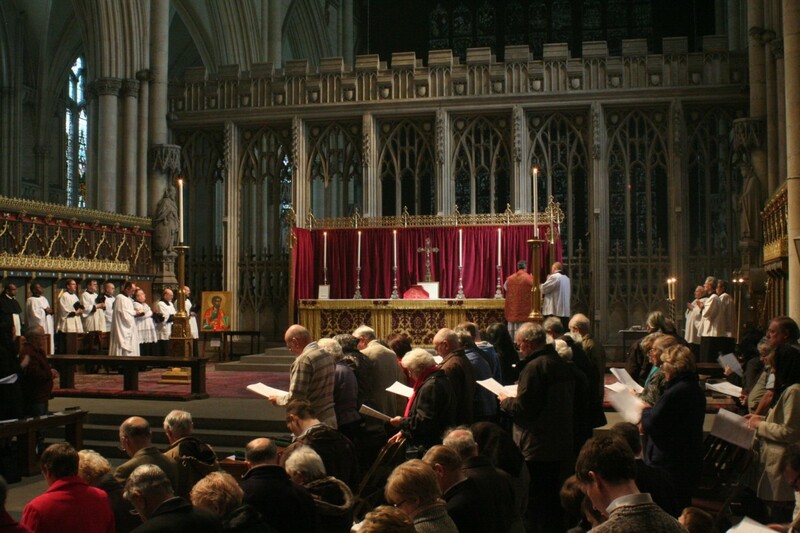 We will need a good crowd to fill York Minster, so please come and encourage others to come. If travelling by car, it may be convenient to uses the Park and Ride service at Askham Bar on the Tadcaster side of York. There will be blessing and distribution of ashes on Ash Wednesda, 9th March, in both York and Middlesbrough. There will be a pilgrimage in honour of St Margaret Clitherow in York on Saturday 26th March. 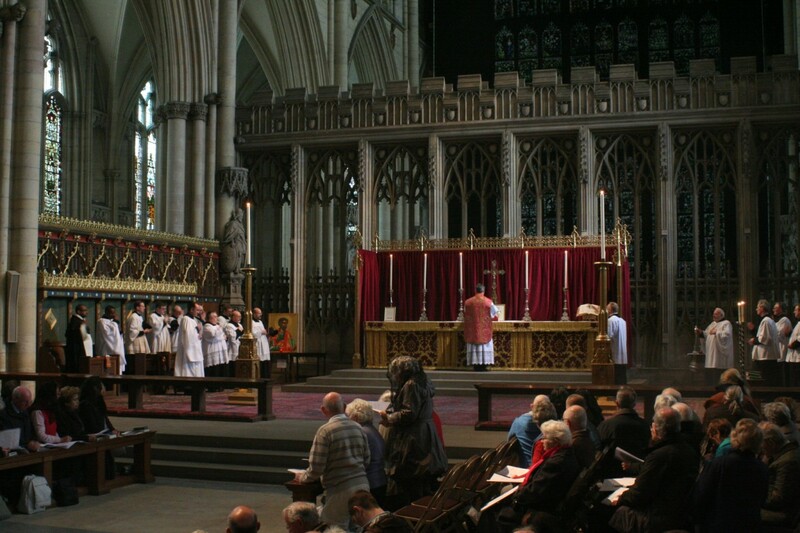 It is being organised by the Latin Mass Society and is expected to attract pilgrims from all over the north of England. St Margaret Clitherow is a patron of the Latin Mass Society. 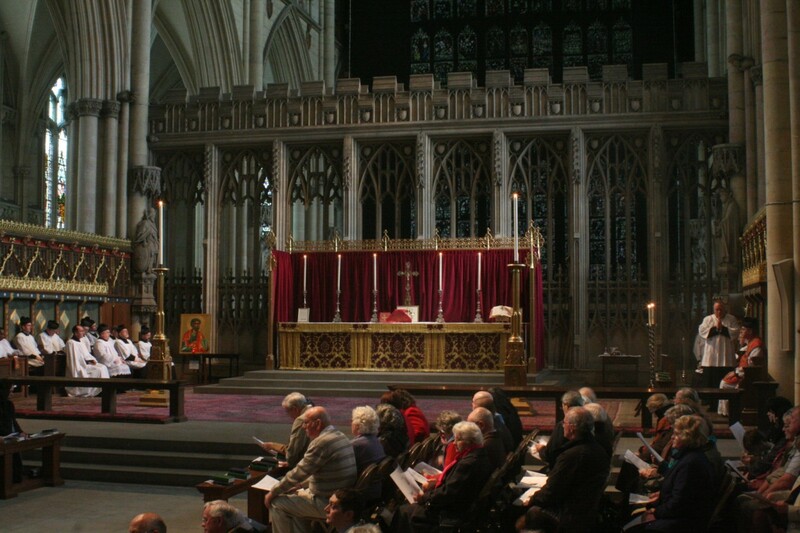 Use of York Minster has been made possible by kind permission of the Dean and Chapter. A coach is being laid on for people travelling from Birmingham (contact Matthew Doyle: 0121 533 9049) and also one from Allerton Bywater. Those travelling by car are advised that parking restrictions in York are severe, and may find it more convenient to use the park and ride service from Askham Bar, on the Tadcaster Road, near to the A64. Thirty minutes should be allowed to get from there to the Minster. 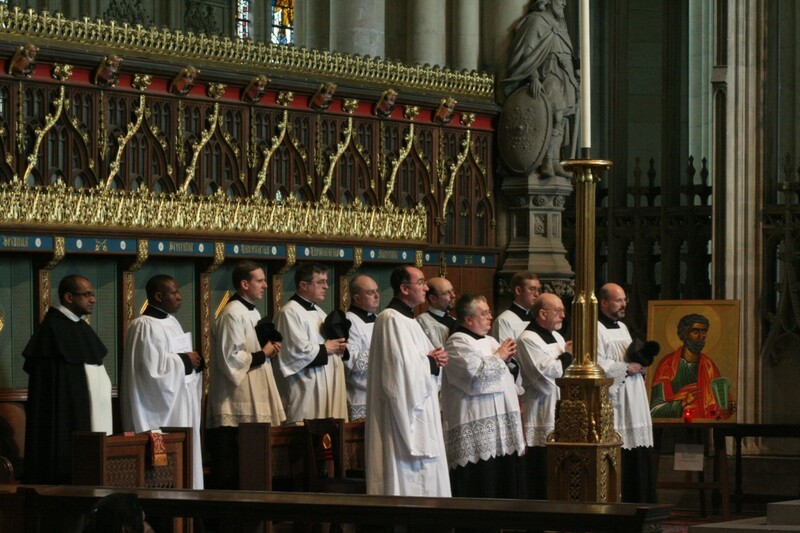 The server training day at the Church of the English Martyrs in York, last Saturday, was attended by 20 men and boys wishing to learn to serve the older form of the Mass. Tuition was given in three groups. Neil Walker, assisted by David O'Neill took the advanced group which studied Missa Cantata. 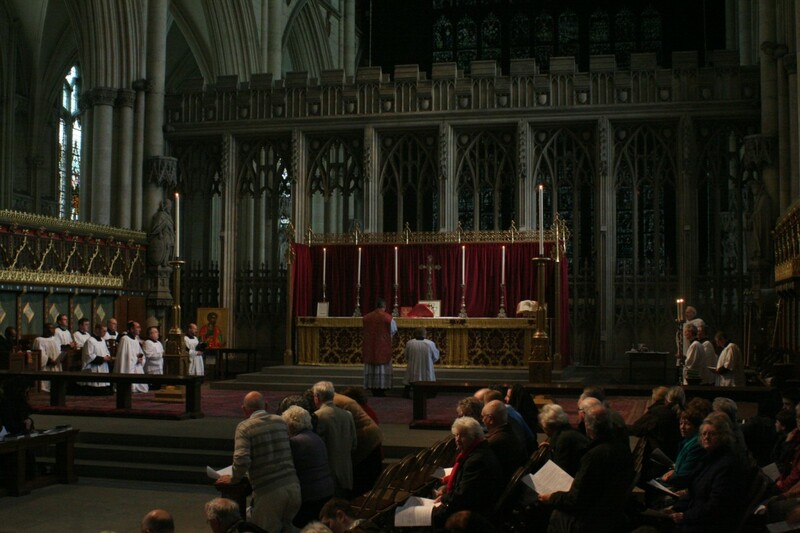 The other groups, lead by and Paul Waddington, studied Low Mass. The day finished with a Missa Cantata, celebrated by Fr Stephen Maughan, and with music by the Rudgate Singers. Saint Margaret Clitherow does not have her own feast day in the calander used with the usus antiquior, but in the new calander she does, and it is 26th March. This year, that will be a Saturday, and there is to be a Missa Cantata in York Minster on that day in honour of this York martyr and patron of the Latin Mass Society. 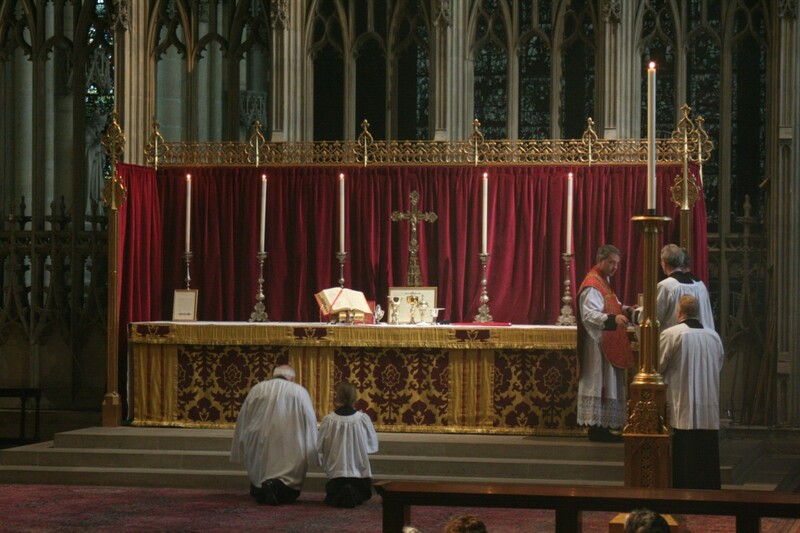 The Mass, which is to be celebrated by Fr Stephen Maughan, will be at 1.30pm, probably at the High Altar. It will be followed by a procession which will pass through the Shambles, where there is a permanent shrine to the martyr; and then cross Ouse Bridge, where the saint was put to death. The procession will end at the Bar Convent, where there will be Benediction and veneration of the relic. 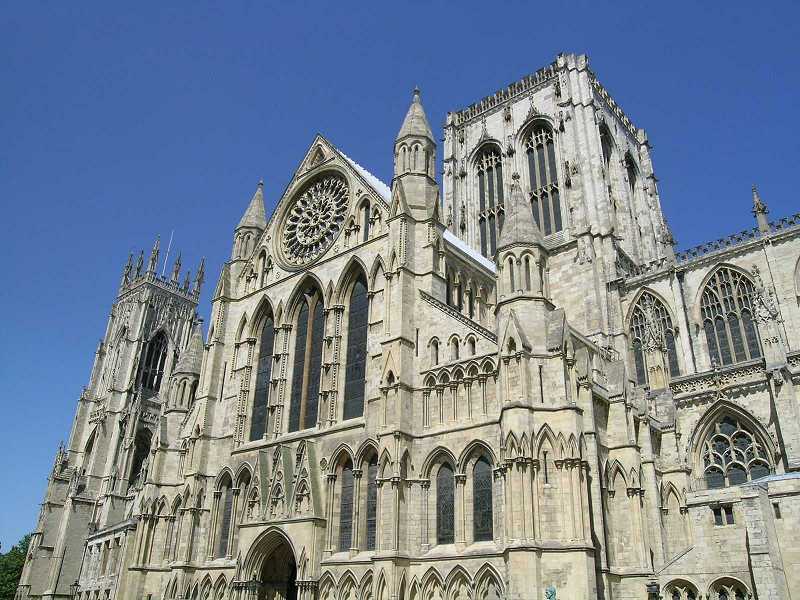 This pilgrimmage is expected to attract large numbers, so pilgrims are asked to be in York Minster in plenty of time. Parking can be difficult in York, so visitors are advised to consider using the Park and Ride service. 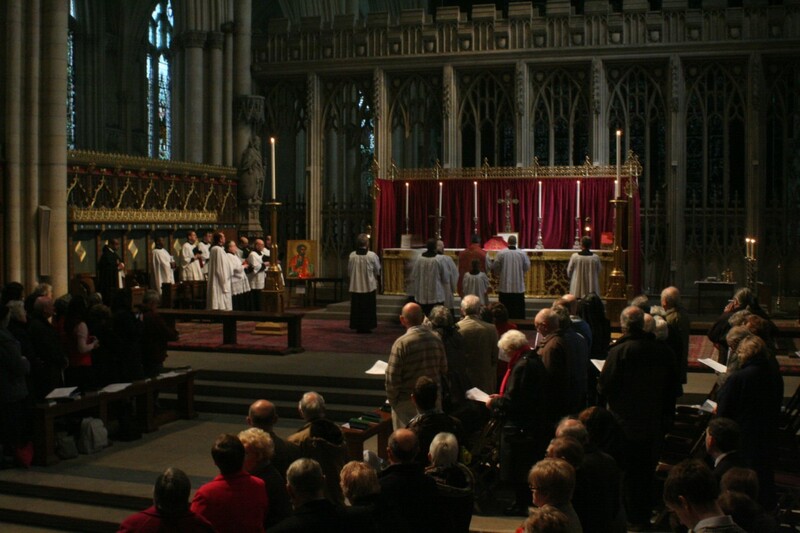 This pilgrimage has been organised by the Latin Mass Society and has been made possible by the kind permission of the Dean and Chapter of York Minster. Wednesday 2nd February will be thw Feast of the Purification, otherwise known as Candlemas. 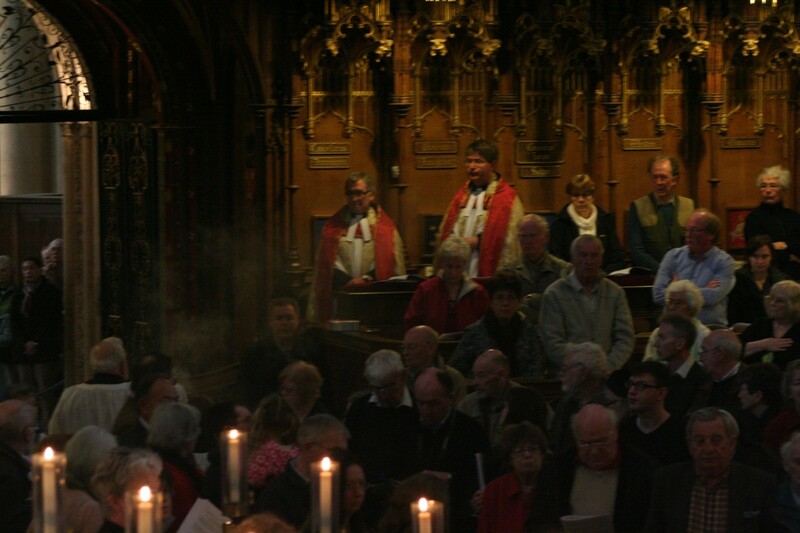 It marks the end of the season of Christmastide and candles feature in the liturgy. 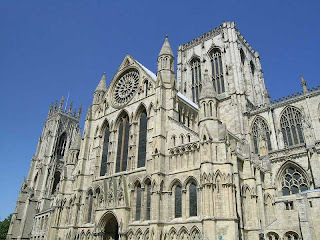 The feast will be celebrated at the church of the English Martyrs in York wit a Mass at 6.30pm. The French traditional organisation, Paix Liturgique, has published some interesting facts about the state of the Church in France, and the increasing influence of the traditional movement. In 2009, 15 priests were ordained specifically to for the usus antiquior, and this represents 14% of the total number of priests ordained. This presumably means that the total number of ordinations was around 107. There are 160 seminarians studying for the priesthood, who are destined to celebrate in the usus antiquior. This is, apparently, 20% of the total, meaning that the total is 800. Paix Liturgique indicate that this percentage is rising and anticipate that it will reach 25%. The number of places where Mass is celebrated in the usus antiquior has increased by 72, from 132 to 204. This is an increase of 55%, but the period over which this has been achieved is not specified. In addition, the SSPX have 184 Mass centres. These look impressive figures. Perhaps the major breakthrough that has occurred in France, but is yet to happen in England, is in the Diocese of Frejus Toulon. The seminary of this diocese teaches both forms of the Roman Rite, and encourages students who favour the usus antiquior. Today, the trustees of Ushaw College are meeting and presumably the main item on the agenda is the closure of the college. One would hope that the trustees will be giving consideration to the proposal that has been put to them whereby an independent Catholic trust would take over the estate and run it as a conference centre and retreat centre, thereby preserving some of its historic and cultural associations. Another thing that they might be considering is the on-line petition, now signed by over 1100 people, calling on the trustees to forestall the closure until all the options have been considered and there has been the opportunity for public debate. The article indicates that, at a meeting later this month, the trustees of Ushaw College will be considering the online petition calling for the closure of Ushaw College to be halted. It goes on to quote a representative of Ushaw College as saying that the college was aware of the petition to forestall the closure and ends withe the comment: "Nobody was available from the college's trustees for comment". 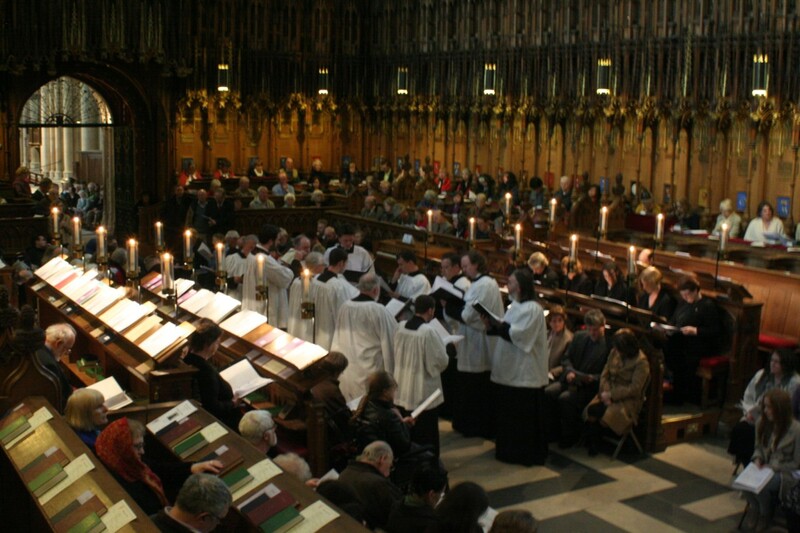 calls on the trustees of Ushaw College (who are the bishops of the dioceses of the northern province plus the bishop of Shrewsbury and are under the chairmanship of Archbishop Kelly) not to close Ushaw until there is proper consultation, and there has been a full examination of alternative alternative uses. The petition has attracted over 700 signitures. Whilst this report is cause for much encouragement, the task of putting forward an a viable business plan, and convincing the trustees to accept it, still remains. Many suggestions have been made for the future of Ushaw College and more would be welcome. It does seem to be the case that there is a widespread body of opinion emerging that is determined to see Ushaw saved.